I spent a couple of hours down at the allotment digging this lot up. Now, we love Jerusalem artichokes. We planted a crop a couple of years ago in a little patch on the allotment and soon had vast quantities of them. We gave bagfuls away to various friends on a fairly regular basis. Huge, huge crop. Last autumn, I dug up all but six plants (or so I thought). 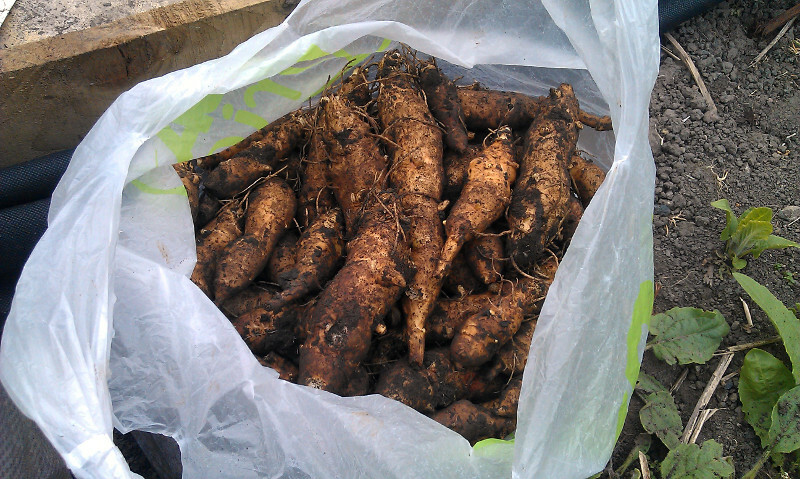 The trouble with the humble Jerusalem artichoke (apart from the… ahem… effects it can have) is that whilst it’s relatively easy to grow, the hard bit is getting it to *stop* growing. Today, for example. Those six shoots had multiplied, and were covering an area about a metre and a half square. I set to, digging them up. This time, no artichokes would remain. 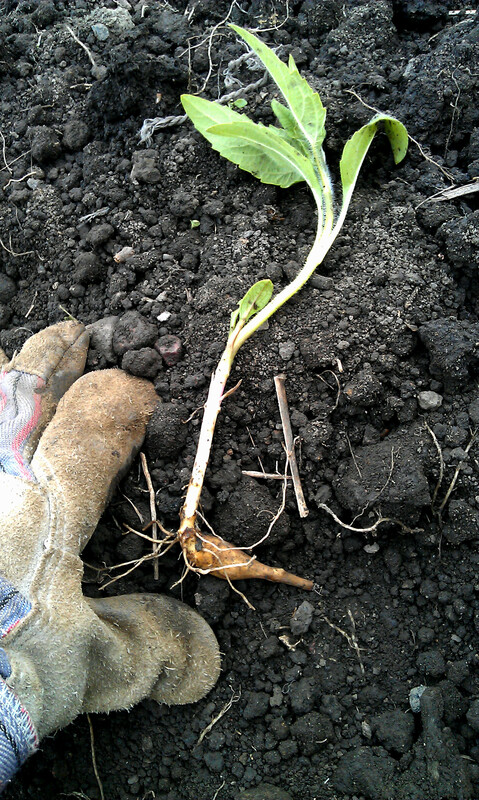 Some of the shoots had tiny little tubers, so I saved some for a friend. Cute, aren’t they? As I said, these little blighters spread, so you’ve got to be careful. 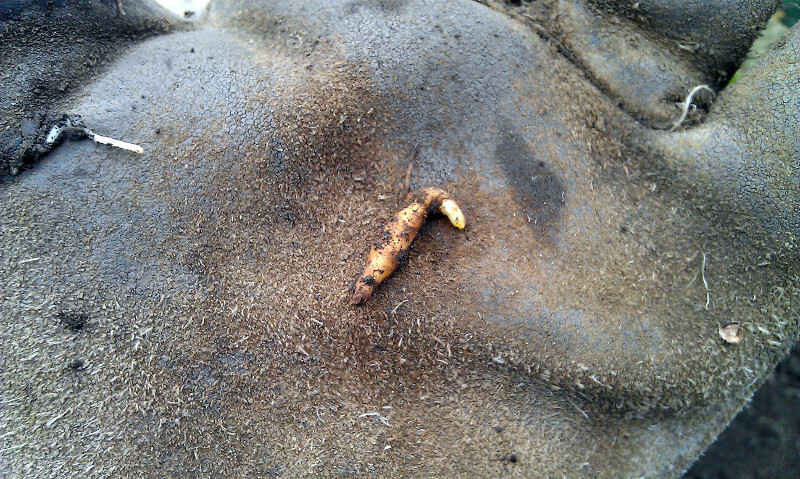 The tiniest bit of tuber left in the ground *will* quite cheerfully sprout, and will proceed to take over as much space as they can. They’re like triffids, albeit very tasty ones. They’re also incredibly fragile. You can just look at a shoot in the wrong way and it’ll snap. And the worst thing you can hear when attempting to clear a plot of artichokes is the little *crack* of an artichoke breaking. It’s like the tuber is going ‘aha! You won’t get rid of me *that* easily!’ before burrowing deep, only to reappear weeks later. That’s a bit like Dandelions – they’re not as tasty though. I didn’t realise that they’re actually a species of sunflower! I’m glad that lovelucie1 said that – I’ve never had one either, and I’ve had an allotment for eight years! Though judging from the difficulty you’re having in getting them up again, I have decided here and now never to plant any. I have enough trouble with dandelions, creeping buttercup etc etc to add another problem to the mix! I’m sure we’ll have some more growing up soon enough, I’m sure we can spare you a batch!